Inspired by the Amanda Knox case, this novel (the author’s second) tells the story of an American foreign student accused of murdering another American while studying abroad in Buenos Aires for a semester. Lily Hayes and Katy Kellers are roommates with a host family, the Carrizos, and while they get along well enough, they are mildly competitive. Katy is the “good” girl, who studies at night, charms the host mother and is getting over a recent break up. Lily is wilder. She bonds with the father of the host family more than the mother, she gets involved with an American boy who is the Carrizos’s neighbor and works at a local club. Five weeks in to their stay in Argentina, while the Carrizos are out of town for a baptism, Katy is murdered. Lily is one of the main suspects. Lily’s family (divorced parents and a younger sister) come to Buenos Aires to support her and come to terms with the fact that Lily is incarcerated in a foreign country. Told in alternating chapters the book recounts the weeks before and after Katy’s murder, exploring the question: could Lily have killed Katy? This is a well-crafted book with great character explorations. I was very drawn to Lily’s dad, who is open and genuine, and to Lily herself. However, the scenes of Lily and Katy arriving in Buenos Aires were less compelling to me, than the scenes after the murder. The girls didn’t seem as curious about their new culture as I thought they might be. However, duBois does a great job exploring the connections between characters and in particular draws an interesting portrait of Lily’s family. Her parents lost a child before Lily and her sister were born and it is harrowing to think that they could lose another child to a Latin American jail sentence. I really enjoyed the themes explored in this book, in particular the idea that could Lily, a well-bred white girl attending a liberal arts college with well-meaning law abiding parents, commit murder in another country? DuBois examines Lily from multiple angles, including the view of the Argentinean prosecutor, Eduardo Campo. 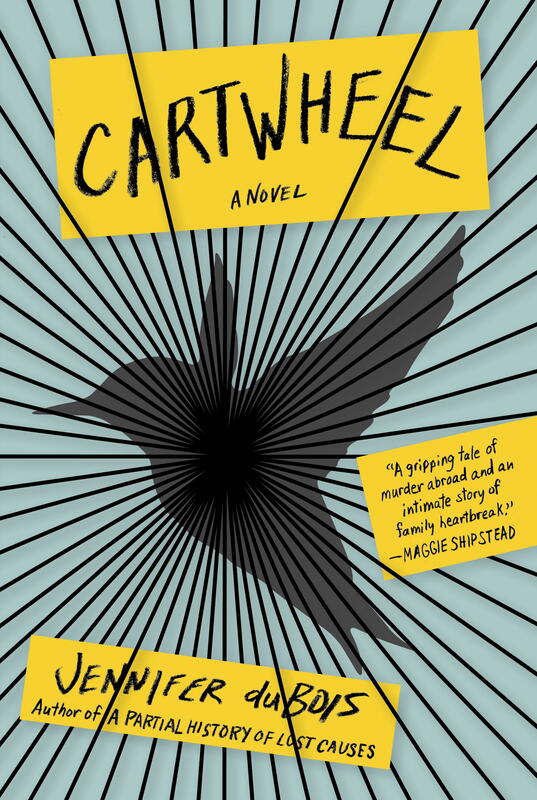 Cartwheel is a good read and an interesting look at how females can subvert each other. DuBois teaches in the MFA program at Texas State University-San Marcos. She recently won a Whiting Writers’ Award. Congrats! I received an e-book copy of this book from the publisher via Net Galley. Adut is a South Sudanese woman from the Dinka tribe who in the late 90s, during her country’s civil war, is enslaved and brought to the north. Sandra is a Canadian woman who decides, in 2004, to move to South Sudan to volunteer with an aid society after two traumatic moments in her life. The novel alternates between both woman’s stories and voices. Adut recounts her life from the late 90s to 2004. Sandra tells her story in the Sudan in 2004. From the opening pages of this book, it is implied that the two women meet and this built a suspense that kept me turning the pages, wondering how and when that would happen. This is a captivating and moving book. Schnell does a lovely job capturing Adut’s voice. Although I had read about the civil war in the Sudan in newspapers, this book humanized the plight of the women there for me. I felt deeply for Adut, her family and what they went through during the war, some of which was violent and hard to read. I also learned a lot about a period of history that I do not feel has been captured much in Western literature. The only other novel I have read about modern Sudan is Dave Eggers’, The What is the What. And while Eggers did a good job rendering his male character’s experience, Schnell does an equally good job rendering the female experience. Sandra’s story is also intriguing, but I felt Adut’s story really carried the book. Schnell is a Canadian who has spent time in the Sudan and other parts of East Africa. I did not find a lot of reviews of the book in the U.S. press, but she has been written about in Canada. She lives in Saskatchewan. I read about this book online and then had a little trouble tracking it down in the U.S. (even in Brooklyn!). My local Barnes and Noble said I would have to pre-pay for it, as it was only available print-on-demand. My local independent bookstore said that it had not been published in the U.S. yet. But Amazon had both new and used copies. I am not sure what the issues were at the other locations. This book is well worth tracking down. During the mid-nauts, Nick Platt moves from London to Moscow with his law firm and spends four and a half years working in Moscow, and enjoying life during Russia’s oil boom. At the beginning of his third year abroad Nick meets two Russian women, Masha and Katya, on the metro, who change his relationship with the country. Told in the second person, Nick recounts this final year in Moscow to his fiancée. Snowdrops is a slow-burning thriller that gradually unfolds on the page; I will be careful not to give away too much. It is a very voice-driven story and I found Nick to be an open and accessible narrator who builds suspense with very little drama. Most of the story recounts Nick’s day-to-day life: dates with Masha and Katya, visits with their aunt Tatiana Vladimirovna, business deals with his law colleagues, and lunches with Nick’s journalist friend Steve Walsh, but it is quickly apparent that something deeper and more ominous than nights at bars and lunches with vodka shots happened to Nick that last year in Moscow. You just need to read until the end to find out what happened…. This book was shortlisted for the Man Booker Prize in 2011. A.D. Miller is an English journalist who lived in Moscow and worked as a correspondent for The Economist. After reading this book, I was interested to see that it got mixed reviews on GoodReads with many people not liking the narrator and feeling the story was flat. I enjoyed the narrative voice and felt that the telling to an off-page fiancée harked back to mid-20th Century novels, like The Good Soldier by Ford Maddox Ford. My only complaint with the book is that it focuses on the negative aspects of Russian culture – bribery, fraud, men with a cell phone for each of their lovers, strip clubs and crime – in a way that confirms Western biases about corrupt Russian culture. But I thoroughly enjoyed this book and kept turning the pages to find out what happened to Nick. After reading an inspiring collection of books published in 2012 and 2011, I am going to focus my reading a bit more in the next month and read books that are set outside the U.S. I was curious to focus on books about expats, but have only found a handful that I have been drawn to. So some of the books will be about expats, and others will be by non-American authors. Next week, I will be reviewing The Lotus Eaters by Tatjana Soli. A debut published in 2010 about a female American photographer who covered the Vietnam War. From there I will travel on to Russia, the Sudan and I am not sure where else yet. If you have read a debut book set outside the U.S. that you liked, please leave a comment and tell me about it. Sam Leroux, a white South African academic living in New York City, is invited to write the biography of Clare Dane, an eminent white South African novelist. Sam returns to South Africa to interview and work with Clare in the Western Cape before moving to Johannesburg with his American journalist wife to live. From the first page of the book it is revealed that the Clare and Sam have a connected history, but neither discusses their past connection as the stories of their lives unfold. Told in four voices the book captures Sam’s present story, both of their histories and Clare’s fictional world via chapters titled, Absolution. Flanery, an American now living in the UK, does a great job capturing the precarious social situation of contemporary wealthy white South Africans who live in large homes with plenty of help and yet exist behind walls and carry panic buttons when they go out. He also provides a brief look into the anti-apartheid movement. Absolution is one of the best books I read this year. It is ambitious, thought-provoking and very real. It is also a book that unfolds as you read it. As details are revealed about the characters’ present and past lives, the connections between Clare and Sam twist and turn. This book is as much about storytelling as it is about the story itself and I liked how seamlessly Flanery did that. He kept me turning the pages, eager to put the story together and learn the “true” histories of Clare and Sam. I don’t want to give much more of the story away as the reward of reading this book is to read it without knowing where it will take you. Nominated for many book prizes this year, Flanery is a remarkable author. Adam Gordon is an American poet spending a year in Spain on a writing fellowship. Told from a close first-person point of view, this book recounts the ups and downs of his year as he struggles to communicate in a language he does not fully comprehend and grapples with what it means to be an artist. The book’s fluid storytelling guides the reader through the minutiae of Adam’s day—every coffee, every cigarette, every visit to the Prado and a lot of time trying to talk to Spanish people. I enjoyed this book because it gracefully captured a liminal feeling that I have experienced when living overseas This book is voice driven, without much story arc, but I still found it engaging, mainly because how true it felt. The bulk of the story revolves around Adam’s Spanish girlfriend Isabel, who he is not sure he wants to commit to and who is not fully committed to him; his friend Arturo, who he meets randomly in a bar and turns out to also be an artist and art owner; and Arturo’s sister Teresa whom Adam is attracted to, but unclear what to do with his attraction. The narrative drama, however, is the backdrop to Adam’s musings on art, life and truth. He is an American unleashed for a year and Lerner takes us on a ride with him. This book was widely reviewed, a winner and finalist in book contests and chosen for a handful of “best of” lists. Lerner is also a poet with three books of poetry under his belt. He teaches on the faculty at Brooklyn College.